The Style panel of the Contents pane controls formatting for an entire component, that is, an entire drawing, labels component, or images. Style settings include choices of colors and symbology in drawings, fonts and sizes in labels layers and choices of channels and other display attributes within images. 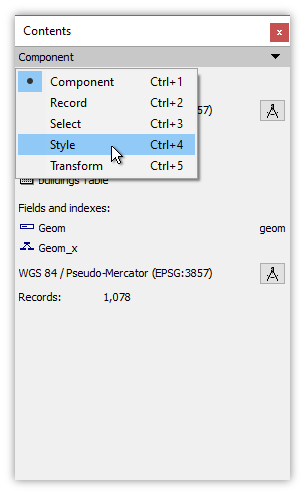 For drawings and labels, the style panel allows us to display characteristics in a fixed way or to specify how the values in a field can dynamically vary display characteristics for each record, a process known as thematic formatting in GIS. Style overrides, found in the Style panel's Options tab for drawings and labels, provide controls that allow individual objects or labels to ignore the overall Style properties for the layer and instead to use their own, individual styles. Open the Style panel in the Contents pane by pulling down the panel menu and choosing Style. A keyboard shortcut of Ctrl+5 also switches the Contents pane to the Style panel. Example - For a detailed example, see the Example: Style Panel Quickstart topic, which provides a step-by-step, tutorial introduction to using the Style panel to apply color, symbology, size and rotation to areas, lines and points in drawings. Selection commands - Many of the same keyboard shortcut selection commands that work in tables work in various Contents panes panels that show rows of items such as the Layers panel or interval rows in the Style panel when doing thematic formatting. Ctrl-I inverts the selection, deselecting those rows that were selected and selecting those that were not selected. Ctrl-click the row handle for a row to toggle selection for that the row. Ctrl-click selects an unselected row, and deselects a selected row. To Select None from the keyboard, do a Ctrl-A followed by a Ctrl-I. Example: Format a Drawing using the Style Panel - In this example we provide a first, step by step look at how to format areas in a drawing using the Style panel. We can specify the same formatting for all areas or use a field to automatically set formatting, a process usually known as thematic formatting. Example: Format the Size of City Points by Population - A common GIS task is to format the size of points in a drawing based on some value. For example, the size of points that represent cities might be formatted based on the value of the city's population, with cities that have larger populations being marked by larger point icons. This is an example of thematic formatting and is easy to do using the Style dialog.